Ethereum Price Analysis: ETH Bliss, $170 The Only Obstacle To $360. Craig Wright has his reasons to doubt Ethereum’s goals. The super computer talks and smart contracts and the ICO launching platform did differentiate ETH as a token and Ethereum as a platform driving its value to spot levels. Backed by dedicated developers–most working pro-bono, projects find this network irresistible despite current limitations. Scalability is a challenge and will remain so as long as it remains decentralized with no compromise designed to accelerate speed. Through Constantinople, the network is working towards achieving an amicable yet practical solution towards Serenity. At that last stage, like the Voltaire in Cardano, Ethereum will be scalable, have a better VM and most importantly, the throughput would be in millions if not billions. However, in the path towards this dream, sacrifices must be made. Miners did their part and through EIP 1234, thirding was executed while simultaneously pushing the difficulty bomb for another year. Thirding is a way to reducing ETH inflation, drawing demand during the ice age as the network intrinsically discourage mining in preparation for Casper. Constantinople was a success and another proposal now is the drastic slashing of GAS fees. Payable in ETH, all transactions within the network is charged. Eric Conner (who is building ETHHub) proposes reduction of GAS fees by 90 percent eliminating the need of auctioning which he says is a source of frustration. At the time of press, Ethereum (ETH) prices are stable. Perched at second place with a market cap of $14,430 million, ETH is widening its gap with XRP meaning Constantinople has had an effect on price. This was expected and as mentioned in our last price piece, ETH bulls are in control as long as prices are maintained above $135. Ceilings remain at $170 but unless there is a rally above this mark, risk-averse traders should stay on the sidelines until after our trade conditions are meant. The arena is open for aggressive traders who should fine tune entries in lower time frames with reasonable target at $170. In the short-term, buyers appear to be in control. However, when we take a snapshot of price action from a top down approach, Ethereum (ETH) bears are in control. Worse still, prices are within a bear breakout pattern with clear resistance at $170. 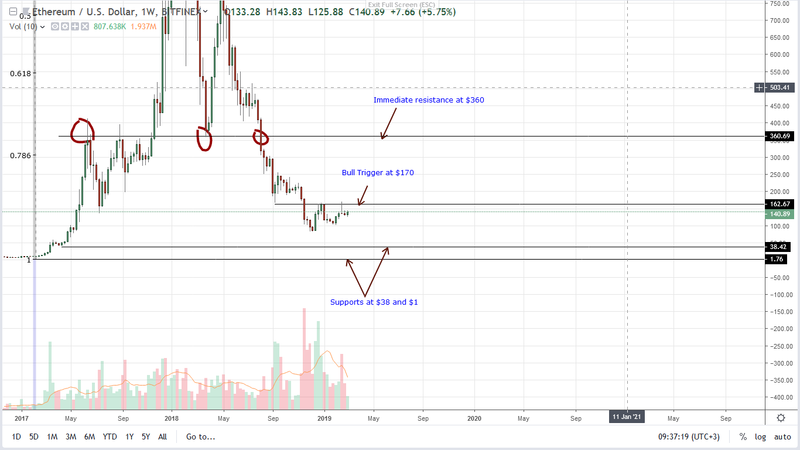 The level is a strong obstacle for bulls and as previous support now resistance, the demand for ETH must be high to force a close above $170 invalidating the possible retest and the bear breakout pattern of mid-Nov 2018. If not and for a second time this year bulls fail to close above $170 and instead prices recoil with an accompanying bear bar, ETH prices could collapse below $150, $100 and last year’s lows of $70. Recent higher highs may be pumps of a retest phase as mentioned above. We cannot be conclusive until after prices close above $170. All we know is that the volumes of week ending Nov 25—6 million versus 2.1 million, influences our ETH/USD price action. Visibly, participation has been dropping until recently when volumes began rising as prices edged higher. With weekly averages of around 2.1 million, we need a sharp uptick above 6.5 million as ETH prices expand above $170 reversing losses of late Nov 2018. The post Ethereum Price Analysis: ETH Bliss, $170 The Only Obstacle To $360. appeared first on Ethereum World News.